Raising a preschooler can be an intense mixture of challenge and joy. On the one hand, you want to impart to your young child all the things that they need to know at their age, and on the other hand, you just want them to be able to grow up in an unscripted, joyous, carefree childhood. Added into the mix is that children of preschool age are very good at resisting you in precisely the areas where you want to make progress on something. One of those areas is language development, and fortunately, this is an area that you can work on (hopefully) as painlessly as possible. The idea is that you create activities that are so fun that your child doesn’t even realize that they are developing their language skills in the process. 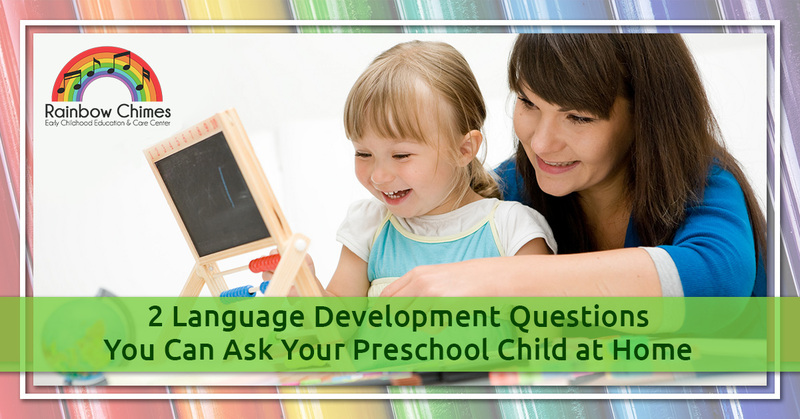 Use these tips from our day care in Huntington to stimulate your child’s language development. Ever notice how your preschooler loves to ask a string of “why” questions? While it might drive you crazy at times, have you ever thought of asking “why” back? Around the age of 3 or 4, children begin to discover a sense of the relationships between cause and effect in the world, and they are naturally thinking about the reasons why things are. We recommend using a lighthearted, fun approach that gives your child your full focus while entering into their world to get them talking. Ask a question like, “Why does your teddy bear love you?” Kids can come up with the wittiest answers, so go with the flow and accept whatever they say. When your child comes up with an answer, ask why again. Do this with a smile and keep the conversation going as long as your child stays interested. (Hint: They will probably love the fact that you’re giving them your full focus, so they may be able to keep going for several rounds of this.) End with giggles and snuggles. You can have a lot of fun with this one, and you might even want to have your video camera out when you start. (However, be watchful of making your child self-conscious that they are being recorded.) Come up with a “how” question that you know your child doesn’t know the answer to, and then listen to their explanation with full seriousness and draw them out with as many follow-up questions as possible. You’ll get some off-the-wall answers! Here are a few to get you started. How do you think your eyes work? How do trees make leaves? The point is not for your child to know the answer, it is to get them talking. It’s good for your child to articulate their thoughts, even silly ones, and they will be practicing using their words and exploring cause and effect relationships, which is a vital critical thinking skill. You’ll also be fostering safe, fun, friendly conversations from an early age, and just think—you’ll be glad you did when your child becomes a teenager. You can’t always be there, but when you’re away, your child deserves to have a place that’s just as committed as you are to their healthy development. Start the enrollment process today by contacting us.